What a heart-stopping episode! I usually try to stay away from anything that would scare me, like all things that fall in the horror genre, because I have an overactive imagination. 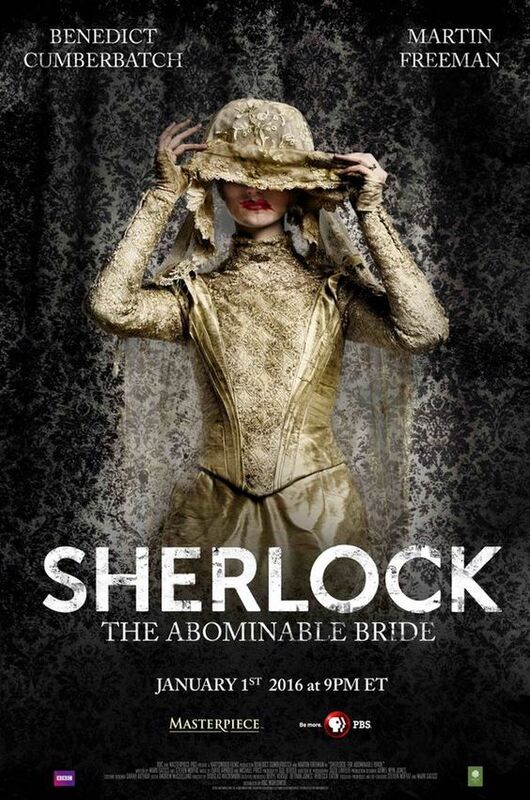 Understanding what The Abominable Bride was all about, you would expect to be prepared. NOT! It was a chilling experience. A good, excited, all things I expected from this series, kind of experience, but still, chilling. From the first 10 minutes! The story starts off in 1890s London (which is one of my favorite eras) with Sherlock and Watson being approached by Lestrade with a very troubling case. That’s not unusual and pretty much how things normally start for this detective duo, but the troubling part is, well, troubling. drum roll plus spoiler alert warning: Someone was killed by a someone who was already declared dead gasp! So off Sherlock and Watson go, trying to figure out how a ghost can kill someone and they are trying to solve it with a community where some people still strongly believe in superstitions and all things paranormal. I absolutely love this episode. We start with the story line. I enjoy the fact that this case is taking place in 19th century London. A time before some of the technological advancements of the time and strong believers in superstitions within the community. Where ghosts weren’t too far-fetched and almost plausible. The story keeps a consistent pace and does a nice job weaving in the pieces of the story to create the entire plot. In addition to that, this episode also ties itself to “present day” Sherlock and Watson story lines such as Mary Watson and Moriarty. And my favorite thing about this episode is the blend of past and present. It’s almost like 19th century Sherlock and Watson is running parallel to present day Sherlock and Watson, solving a similar case or, well, a similar problem. The blend of both timelines, stories, and themes was so much fun to watch and put together in a way that just worked. Sherlock and Watson have a moment, the in 19th century time line, where Watson touches on Sherlock’s … love life so to speak, which was a nice play on their friendship side of things. After all, Watson is married and, well, that’s that. With season four on its way, you know Sherlock’s character development has to evolve in some ways, whether he sticks on that trajectory and makes it back to his single self it will be interesting to see how they follow up on this. As always, Benedict Cumberbatch (Sherlock) and Martin Freeman (Watson) continue their great on screen chemistry as friends and colleagues. In addition, you have Amanda Abbington (Mary) and Mark Gatiss (Mycroft) making an appearance as well as Rupert Graves (Lestrade) and even Andrew Scott (Moriarty) in this episode. Oh, and Louise Brealey (Molly) is in this one as well and I love the part she played and how they portrayed her … well, I’ll stop here. I also love this episode because it was interesting to see how Cumberbatch and Freeman portray their personalities across two time periods. How their 19th century counterparts would react to the world around them yet keeping true to their distinct personalities. They did wonderfully, all those who played both timelines. And I have to say, Natasha O’Keeffe, our Abominable Bride was excellent! I mean, chills. Enough said. And, since I’ve gushed on about the two time periods, may as well continue that into presentation. The set directors and costume designers did a great job giving us the feel of two distinct eras. I’m not an expert on historical accuracy, yet, and even if I was I wouldn’t nitpick here because it was done well enough for me to discern 19th century timeline and 21st century timeline. Camera and sound work were awesome. I know it takes a combination of costume and camera work to give viewers the chills, of course delivery is crucial as well, and they did it well. I can’t wait to see what comes next. Especially with Sherlock’s whole “I said Moriarty was back not alive” bit at the end of the episode. What does that mean?! Ugh! Season 4 cannot come soon enough.